Unicorns are just like us. They have problems, stresses, and like to blow off some steam. 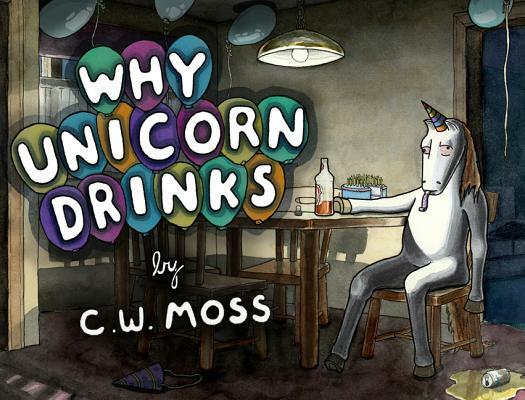 Author and illustrator C. W. Moss explores the psyche of the single-horned in his book, Why Unicorn Drinks. A follow-up to Unicorn Being a Jerk, this volume of nearly 65 four-color illustrations and captions portrays the sad reality of life as a mythical creature, and reveals what drives Unicorn to the bottle. As fans of Moss' online comic undoubtedly know, Why Unicorn Drinks pours a double-shot of laughter and irreverence. You’ll never look at a unicorn the same way again. C.W. Moss is a maker and doer who was born in Missouri and now lives in Los Angeles. He likes long walks on the beach, good music, and is a good listener. He loves having a good time. He is the author of Unicorn Being a Jerk.